Intel is the first company that greets you at the Assistive Technology Industry Association (ATIA) 2010 conference in Orlando, where I’m checking out new gadgets for people with disabilities. (Great timing, as it’s freezing up north.) It’s always a good sign for the industry when a major tech player sets up shop with a glossy new gadget for people with disabilities. Intel is showing off the new Intel Reader, for people who are blind or have reading disabilities, which debuted in November. The Reader is a handheld device bundled with a digital camera that takes pictures of printed material and reads it aloud. Intel sought input from HumanWare to create the product. 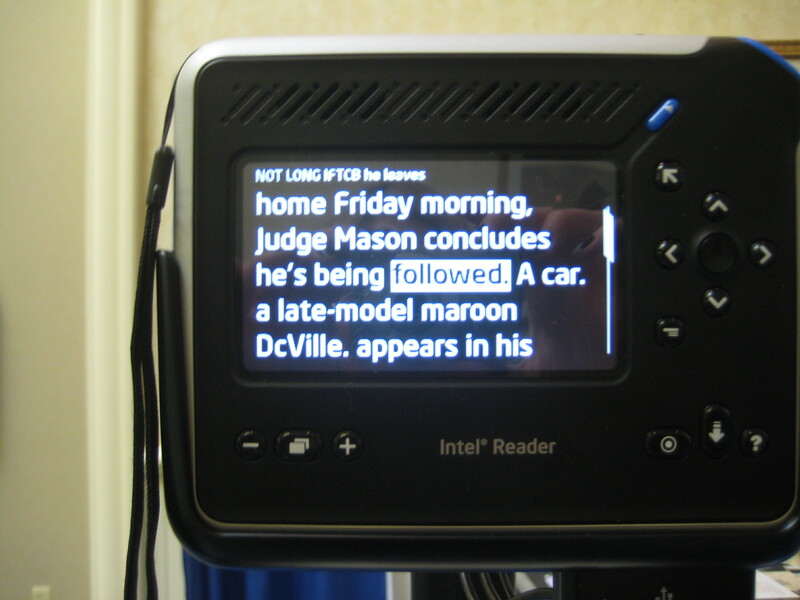 Camera-captured text-to-speech devices are a trend that has been met with mixed views. Some people call the concept genius, as gadgets like the Reader pack a powerful computer and scanner into one, at a cost of around $1,400. Others say Intel is trying to hose the blind with pricey gear that isn’t all that great, and that the real market is not consumers but educations and institutions. Mike Calvo, CEO of Serotek Group, who is blind, offers up his theory: The Reader has no wi-fi capability, which makes it ideal for classrooms. I checked out the Intel Reader and liked what it offered for the classroom. It’s larger than its competitor, the knfbReader Mobile. It’s more designed for reading books and magazines as it comes with a docking station that holds down the book while the camera copies the text, processes it (in about 30-45 seconds) and then reads it out loud. The words can also be spelled individually and the font enlarges to suit those with low vision, dyslexia and other reading disorders. 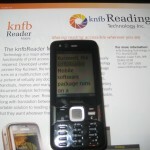 In contrast, knfbReader Mobile, the result of a joint venture between Kurzweil Technologies and The National Federation of the Blind, is more about content-capture on a cell phone. You can use the device, which is smaller and lighter, as a phone, a music player and accessible audio GPS — a great tool for helping people who are blind to navigate streets and cities. The cost is about the same. As both products are both true assistive technologies, we’re used to such prices. It’s hard to justify the cost of reading via a camera snapshot, when one can just buy an audiobook and listen to it. Further evidence, indeed, that the Intel Reader is geared for a textbook. But either would be nice to have in a pinch, when an audio-based book or newspaper just isn’t an option.